Orlando and Vero Beach, Florida (April 18-19, 2017) – K-Water is a leading public corporation specializing in water management technology, focusing on providing the world with clean and accessible water. K-Water provides integrated solutions for water through development of water resources that are in harmony with nature, ecology, and the environment based on advanced water management technologies accumulated over the past half-century and the introduction of scientific and systemic water treatment processes. K-water also hopes to strengthen its global competitiveness by ensuring new technologies for ecological restoration and pollution reduction. With that focus, K-Water personnel contacted HydroMentia with a desire to understand the Algal Turf Scrubber® technology and how it may be employed to help address nutrient pollution issues in South Korea. 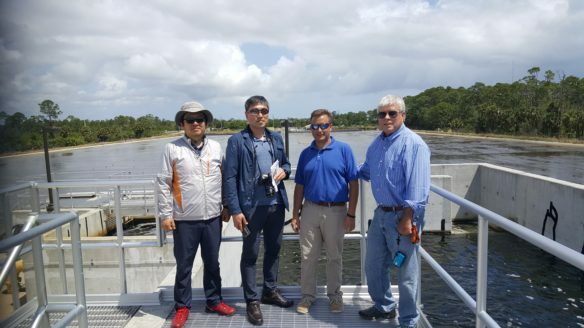 Following extend communications, K-Water elected to travel across the globe to meet with HydroMentia personnel and tour the Osprey Marsh ATS™ in Vero Beach, Florida. Based on this visit, K-Water and HydroMentia look forward to future ventures relative to application of the Algal Turf Scrubber® technology.